For 21st-century field service, the Industrial Internet of Things (IIoT) is a gift that keeps on giving—and what it’s giving in droves is data, massive amounts of it. As even more industrial companies connect their physical assets to the internet, they’re finding that they need effective tools to harness the reams of data flowing from the IIoT. Natural language generation (NLG) technology, an application of artificial intelligence, is becoming an invaluable tool to help industrial companies get the most value from their operational data. Service is one area where that data is already making an impact. NLG software allows service teams to analyze equipment performance data and make actionable decisions on when and how to service that equipment. NLG software extracts relevant information from raw and complex data sets, like sensor data from wind turbines or aircraft engines, and repackages it into an easy-to-understand narrative format. But the real challenge with NLG is delivering a narrative that’s not only based on meaningful business insights, but also reads like a subject-matter expert composed it. To create that narrative, NLG software needs input from the experts who build and service the equipment in question—everything from what sensors are called and how they relate to each other to what constitutes an actionable event. Additionally, the narrative must be accessible to “critical business users who do not have a data science or software development background, but are relied on for operational decision-making,” says Benjamin Decio, CEO of NarrativeWave. Since 2014, NarrativeWave has developed IIoT software that combines employees’ expertise with operational data to create an “evolving knowledge base” of how a company’s critical industrial assets should be operated, maintained and evaluated. 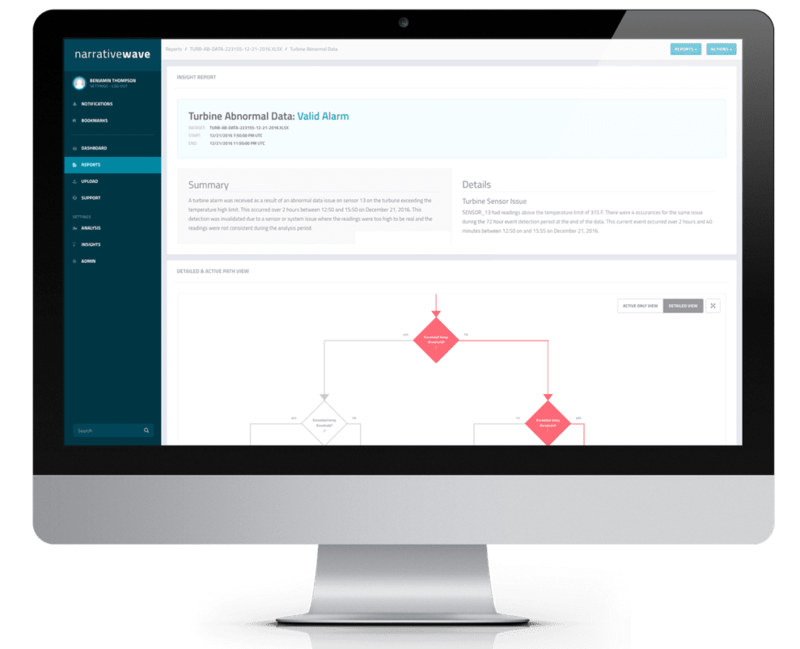 NarrativeWave’s platform dramatically shortens the process of reviewing the thousands of alerts and alarms (many of which are false-positives) sent to service centers from industrial machines. It can take hours for employees to manually sift through IIoT data, diagnose issues and report their findings and recommendations. NarrativeWave slashes this process down to approximately 30 seconds, while auto-generating an easy-to-understand report on the root cause of an alarm and how to address it. General Electric is among the companies that NarrativeWave is helping to manage the constant barrage of alarm and alert “noise” coming from its industrial machines. GE Power’s Monitoring & Diagnostic Team was closely involved in the initial development of NarrativeWave’s software. Since then, NarrativeWave has completed two pilot programs with GE. The company is currently in discussions with other GE business units about using its platform. To benefit from the IIoT, companies like GE that build and manage critical assets (such as gas turbines and aircraft engines) must be able to manage their operational data and generate actionable business insights from that data in real time. Automated decision-making, increased workforce productivity, reduced field service costs, and better customer service and engagement are just some of the potential gains afforded by NLG software’s insights. Decio says that companies are using NarrativeWave’s platform to “build a foundation for more robust analytics” that can help them find ways to improve equipment health and management, prevent critical equipment failures and downtime, and ensure that service-level agreements with customers are met. While NarrativeWave’s technology can automate root-cause analysis, auto-generate service recommendations, and reduce human error by 25 to 30 percent, according to chief technology officer Romain Wurtz, it is by no means a replacement for human experts. Companies still need people to build and service industrial equipment. NLG is just another tool in their increasingly tech-studded toolkits. Jane Irene Kelly, who has two decades of professional writing, editing and reporting experience, writes about business and technology. She is a graduate of Syracuse University’s S.I. Newhouse School of Public Communications and resides in Pennsylvania.